Just a reminder that we have our annual spring J/105 Racing Clinic in a couple of weeks. This year, due to a ridiculously full schedule, we were forced to move the clinic to Memorial Day Weekend, so we know lots of people will have other plans but it’s a great opportunity to get out on the water and prep for the season. So bail on the boring ol’ BBQ and get your jibe on…. This event is great for crews, prospective crews, and skippers. The focus of this particular clinic is on boat handling, sail trim, and on-board workflow, etc. etc… We rotate everyone through all the positions, so attendees leave with the ability to perform any job on the boat…. from main trim, to pit, to bow. If you want to be a more valuable and contributing member to the crew, this is a great way to do it! 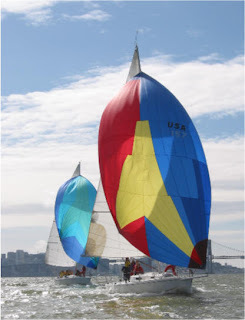 If you own or race on a boat regularly, this clinic can help you define the responsibilities of each team member, streamline on-board communication, and polish sail trim, boathandling, and sail handling maneuvers. Go here for more info… or give us a call.